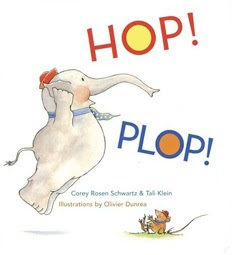 I read this adorable picture book (HOP! PLOP! by Corey Rosen Schwartz) before our move last summer, and I've been thinking about it ever since. But instead of giving up, or deciding that elephants and mic﻿e aren't meant to play together, these two friends find a different way to play. Because children are like that. Where we all too often see differences and divisions, children see kindred spirits and new friends. This book reminded me of our visit to Korea in 2008, when my husband was stationed there with the Air Force. One afternoon, I took my four little, blonde children to the park near my husband's apartment, and as they played, several Korean children joined them. Now, my children only knew how to say "Hello," "Goodbye" and "Thank you" in Korean, and the local children didn't speak much English... Yet they played together all afternoon, speaking in smiles and gestures. 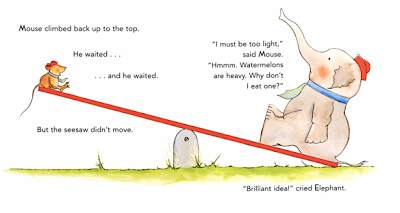 Like Elephant and Mouse, the children found a way to make it work. And maybe more of us should learn a lesson from our children. Originally, I thought I'd end this review by encouraging you to read this book to your children... to teach them the importance of understanding and embracing differences. But maybe instead, you should read HOP! PLOP! with your little ones (or all by yourself, if you don't have a little one to read to), so they can teach the lesson to you.